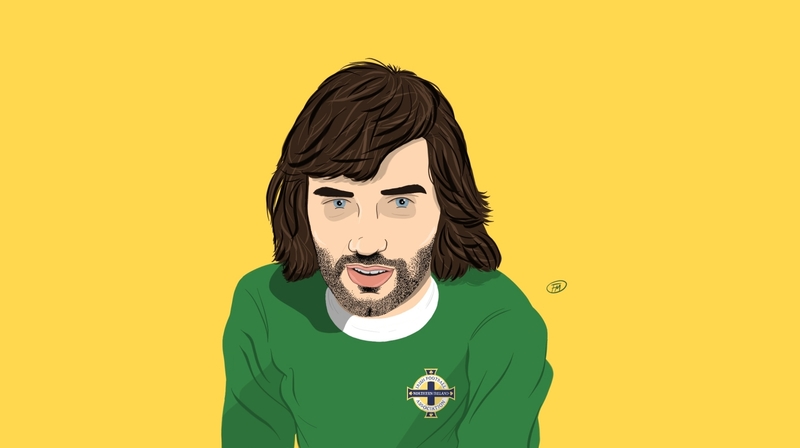 Born in the working-class inner city of East Belfast, it was seemingly inevitable George Best would swiftly fall in love with the beautiful game. Childhood images show the future superstar as a toddler with a ball at his feet, but his lack of physical presence cost him at local club Glentoran, who dismissed the 14-year-old as being ‘too small and light’. It wasn’t long, though, until Best’s unquestionable talent was eventually recognised by Manchester United scout Bob Bishop, who was so excited by the potential his telegram to manager Matt Busby read: “I think I’ve found you a genius.” Two years later and the 17-year-old made his first-team debut at Old Trafford, and quickly rose to stardom. The Northern Irishman seemed to embody United’s values of fast, skilful and direct attacking football, bringing fans – sometimes those of the opposition – to their feet in appreciation. Quickly establishing himself as a mazy dribbler, his play infused immense natural skill, two-footedness, feints, trickery and balance to not only dazzle defenders but find the back of the net. Busby – said to be obsessed with the idea of lifting the European Cup in the aftermath of the Munich air disaster – insisted upon “fierce, often brutal” training regimes with Best to accustom him to opponents both at home and abroad. The major breakthrough moment arrived at Benfica’s Estádio da Luz in a European Cup quarter-final as Best starred, netting two goals, in a 5-1 thrashing of the Eusébio-led Portuguese. The Portuguese press labelled him “O Quinto Beatle”, with the English translation ‘The Fifth Beatle’ then widely used thereafter. The 19-year-old’s mix of talent and showmanship was akin to the famous pop stars and this groundbreaking image ensured mass appeal. Two years later, and with Best’s rise to stardom seemingly unstoppable, Busby’s European Cup dream was finally made a reality with a Wembley final victory over the Portuguese giants. Ten years on from the fateful night in Munich, United landed their more significant trophy and the electric forward played a significant role; firing them into the lead in extra time after a tense match had finished 1-1, with the first ever English champions of Europe running out eventual 4-1 victors. Later that year, the Belfast Boy scooped the Ballon d’Or award, beating teammate Bobby Charlton to the prize. Aged just 22, Best had won a league title, the European Cup and the most prestigious individual award in football. His ascent had been remarkable, as was his forthcoming decline. Busby’s retirement signalled a seemingly irreversible decline at Old Trafford – foreshadowing the departure of another Scottish manager decades later – with Best’s own stardom stifled. There were moments of glory – six goals against Northampton in an FA Cup tie – but these became steadily less frequent. The star struggled to cope with the demands of mass media attention and constant scrutiny. He became easily distracted by temptations outside of football and turned to alcohol. Declining on-pitch performances were intertwined with disciplinary problems; he was handed a two-week suspension by United after going AWOL and repeatedly found himself punished by the club. Best failed to ever replicate his glittering early club career at international level and only ever scored nine goals for his country. His most iconic was never included in any official figure, when his quick-thinking had seemed to embarrass the legendary Gordon Banks at Windsor Park. The English goalkeeper threw the ball into the air in anticipation of kicking it downfield, but the Northern Irish forward managed to get his boot to the ball first to lob the ball towards goal, where he raced towards it and headed home. The goal was disallowed for infringement but encapsulated the genius and innovative qualities of the Ulsterman. Capped 37 times, four of Best’s international goals came against Cyprus while he found the net against both England and Scotland, alongside strikes against Albania, Switzerland and Turkey. He missed the legendary World Cup sides of the 1950s and 80s, but his presence alone ensured Windsor was packed to the rafters with every appearance.